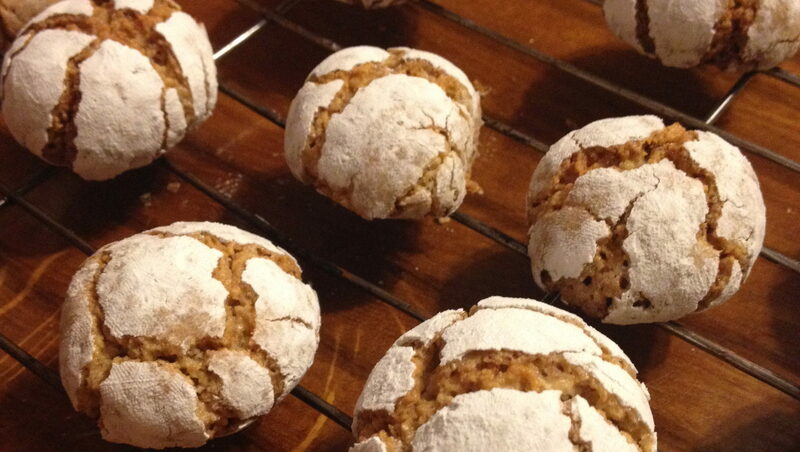 Amaretti Biscuits are a light and crunchy Italian biscuit with the flavours of almond. So easy to make, crisp on the outside and chewy in the middle and they’re naturally gluten-free too. Whip up a batch for a great edible present. SEPARATE the egg yolks from whites into two bowls. BEAT the egg yolks with a whisk and add the sugar gradually. Don’t over beat the egg yolks, just enough so that sugar is combined with yolk and mixed well. ADD the ground almonds and almond extract and combine. BEAT the egg whites until they form soft peaks and gently fold into almond mixture. ROLL out the almond dough with your hands into walnut size balls and then roll in icing sugar to coat. PLACE on greaseproof baking tray and bake for 25 mins.